Excellent. Most crocuses are hardy to -32C (-25F). Topdress with rich compost in spring, when new growth appears. When given too much fertiliser, crocuses may form thick stands that do not bloom well. Snowdrop. Crocuses are wonderful little bulbs to naturalise in grass beneath deciduous trees, or to plant in groups near entryways. Scatter them in small groups along a woodland edge. Crocuses combine well with scillas and early-blooming daffodils. Set out dormant bulbs from late summer to early winter, planting them 3in (8cm) deep. 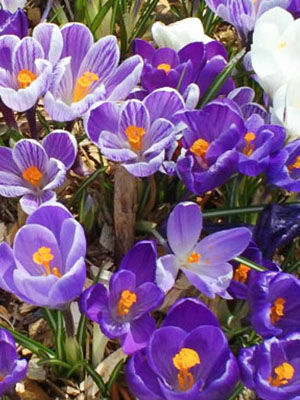 Spacing can be as close as 5cm(2in) between crocus bulbs, which look best when planted in groups of seven or more. Crocuses are considered harbingers of spring. The flowers close at night and on rainy days. Crocuses needs a period of winter chilling, and will not persist long in warmer areas. Varieties classified as C. tommasinianus are not tempting to deer.